Before viewing the video clip discuss the following questions about paintings. Why do people do them? What is their purpose? What are painters trying to communicate? What does the viewer need to know to understand a painting? View the video clip then dicuss and write answers to the following questions. What is the artist’s aim or purpose in creating the painting? What is its meaning to him and to others? Why is it so important to this artist that his culture is passed on in this way? Sketch and write a brief explanation of what concentric circles represent. Sketch and write a brief explanation of what the U shape symbol represents. Write brief notes explaining how Indigenous art uses colour and what these colours mean. Aboriginal paintings are not all the same style. Research to find at least three different styles – including dot style, and X-Ray style. 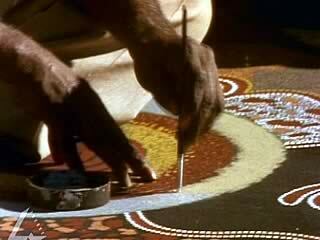 Prepare a five minute lesson on the differences and the similarities in Aboriginal paintings. Be sure to explain the techniques and symbols and to include some visual examples. Present your lesson to the class.